This article will detail the calculations used to compile the Awesome Oscillator to then move on to applying the indicator in practice. 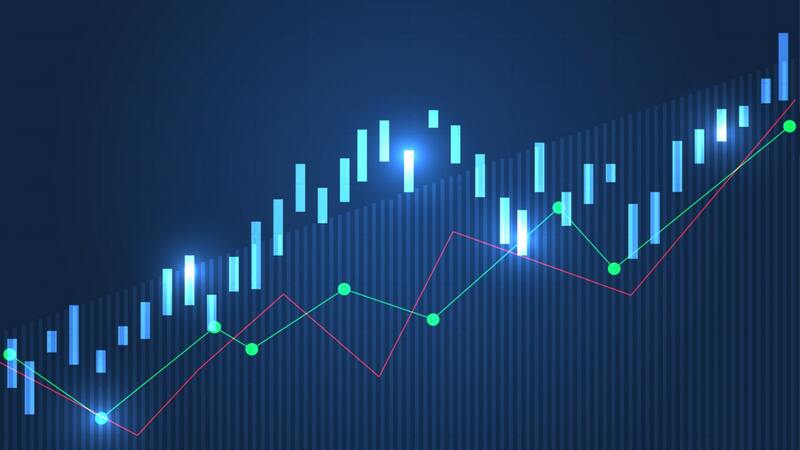 We'll look at how to use the Awesome Oscillator in MetaTrader 4, as well as useful trading strategies involving the indicator. What is the Awesome Oscillator Indicator? The Awesome Oscillator is an indicator that attempts to gauge whether bearish or bullish forces are currently driving the market. It does this by effectively comparing the recent market momentum, with the general momentum over a wider frame of reference. As mentioned previously, the Awesome Oscillator can be viewed as a momentum comparison tool. Specifically, it looks at the last five bars in comparison with the wider time frame of the previous 34 bars. The value of the Awesome Oscillator indicator is calculated as the difference between moving averages over these two time frames. Rather than using closing prices, though, these simple moving averages use the midpoints of the bars (i.e. halfway between the high and the low). The indicator subtracts the 34-period moving average from the 5-period moving average and plots this value as a histogram. This is a simple 'look-back', similar methodologies are used in many effective indicators. 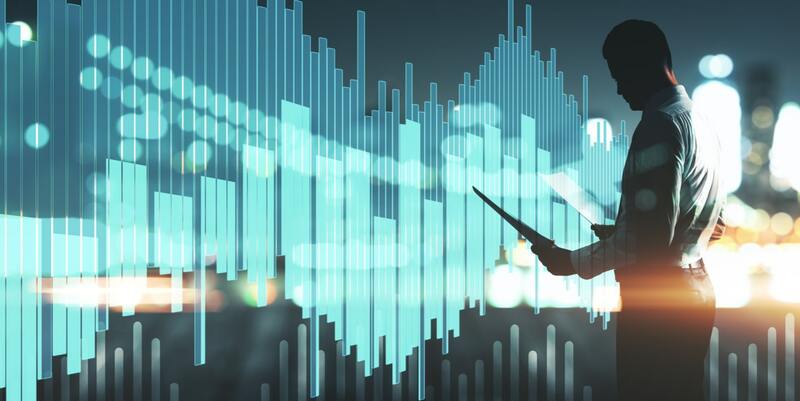 Comparing aggregate price information over different time frames can reveal information about the character of the market, that is otherwise not apparent. Source: MetaTrader 4 - USD/CHF 1 Hour Chart with Awesome Oscillator applied - Data Range: 16 June, 2017 - 23 June, 2017 - Please Note: Past performance does not indicate future results, nor is it a reliable indicator of future performance. The default colours are green for an up bar (a bar where the AO value is greater than the preceding bar) and red for a down bar (where the AO value is lower than the tone prior). But how do we use this to aid our trading? This strategy requires you to look for two 'peaks' on the same side of the zero line. An additional requirement is that the trough between the peaks must also be on the same side of the zero line. A bullish twin peaks signal has the peaks below the zero line, for which the second peak must be higher (less negative) than the first peak. It must also be followed by a green bar. A bearish twin peaks signal is the opposite of this — the two peaks must be above the zero line. Likewise, the second peak must be lower than the first peak, and then followed by a red bar. This strategy searches for quick changes in the momentum and requires a specific pattern in three consecutive bars of the AO histogram, all on the same side of the zero line. A bullish saucer requires all three bars to be on the positive side of the zero line. The construction you are looking for is a red bar, followed by a smaller red bar, followed by a green bar. A bearish saucer requires all three bars to be on the negative side of the zero line. The combination needs to be a green bar, followed by a smaller green bar (i.e. less negative in value), followed by a red bar. As with most momentum indicators, divergence between the price and the momentum can also be a useful clue as to what's going on in the market. For example, if we see the price making new highs, but the AO indicator fails to make new highs, this is a bearish divergence. Similarly, if the price sets new lows and the AO fails to follow suit, this is a bullish divergence. 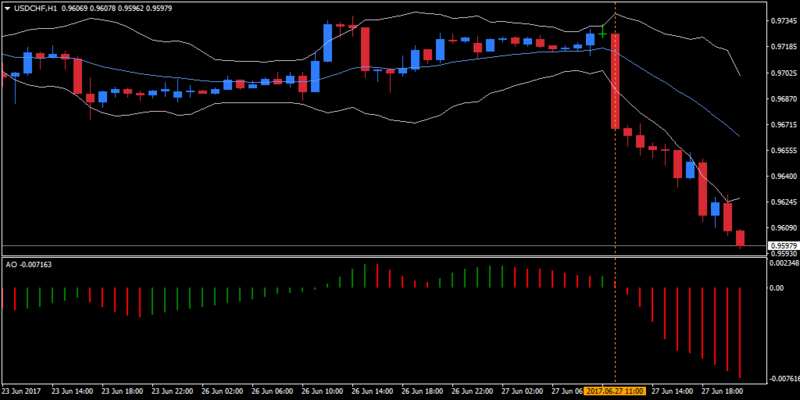 So, by looking out for these particular occurrences, you can use the Awesome Oscillator as a divergence indicator. Now bear in mind that these signals are no cast-iron winners. 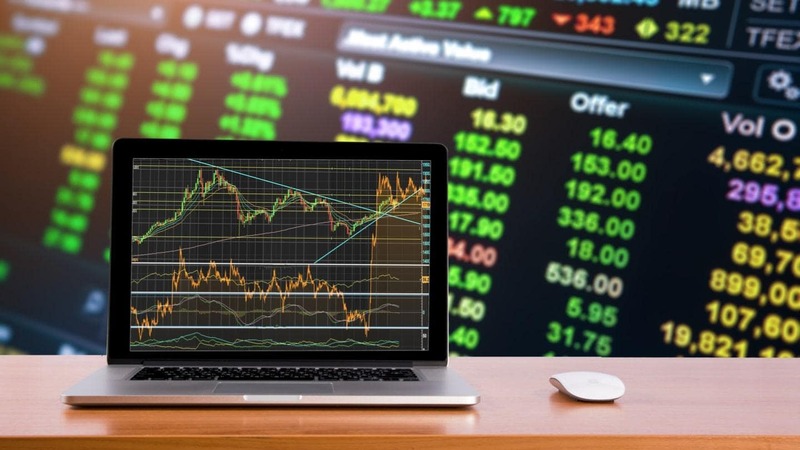 Think of them as setups, which is to say, specific occurrences in which we have previously observed a tendency for the market to behave a certain way. 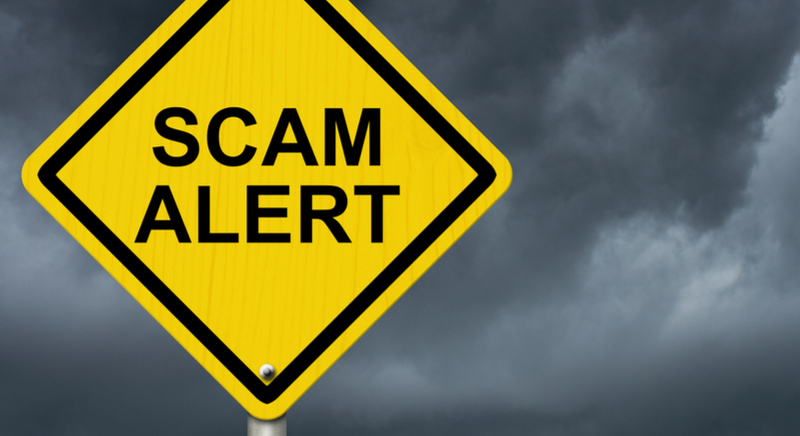 There is an increased likelihood when a bearish setup occurs that the market will go lower. Nevertheless, there remains a significant chance that it will rise in such circumstances. Which is to say, a lot of these signals will prove to be incorrect. This is perfectly normal, of course – no indicator can tell you for sure what is going to happen. Source: MetaTrader 4 - USD/CHF 1 Hour chart - Data Range: 23 June, 2017 - 27 June, 2017 - Please Note: Past performance does not indicate future results, nor is it a reliable indicator of future performance. The dotted vertical line on the chart marks a crossover below the zero line for the AO indicator, and a price breakout below the lower Keltner Channel. The combination of these signals gives us a strong bearish signal. 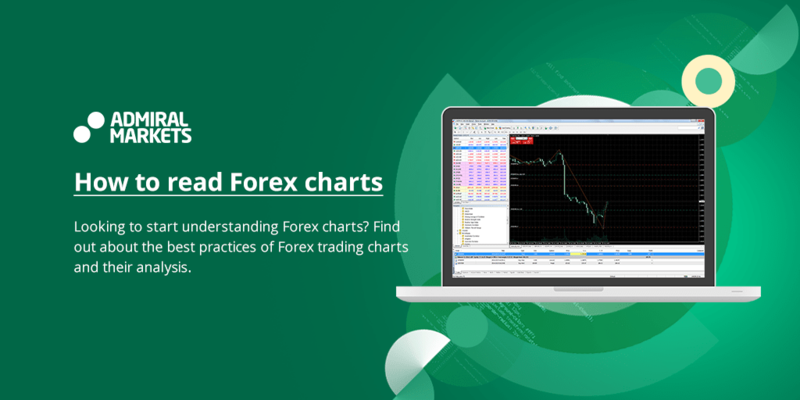 Keltner Channels do not come as standard indicators with MetaTrader 4. They do, however, come as part of the extended package you get with MetaTrader Supreme Edition. 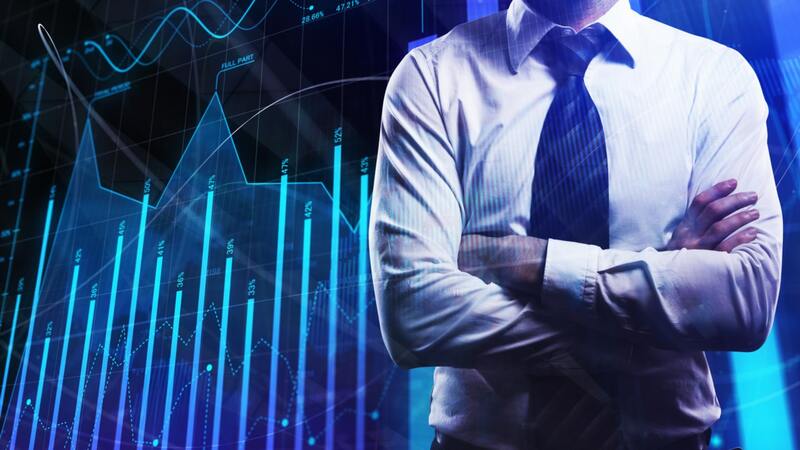 MTSE is an advanced plugin for MetaTrader 4 and MetaTrader 5 that has been specially designed by market professionals to provide a cutting-edge trading experience. Not only does it offer you a wider selection of indicators, but it also gives you upgraded functionality for order handling, tick charts, and backtesting. 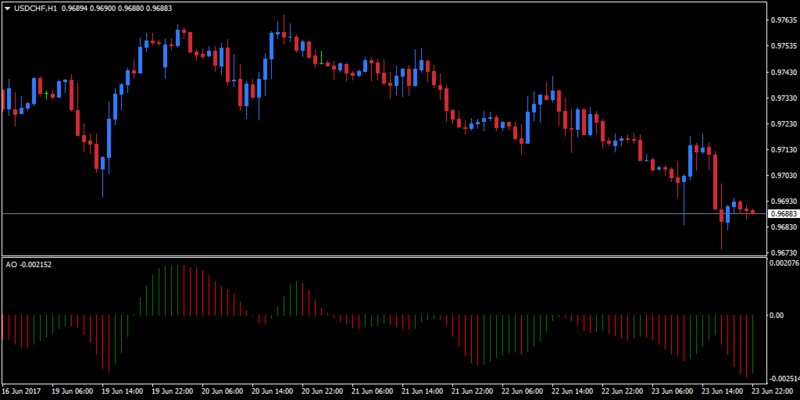 This article has detailed several types of signals that you can generate using the AO indicator. Ultimately, you need to experiment with them, and decide on the best way for you to implement them as part of a trading system. Find out for yourself whether the AO is indeed an 'awesome indicator' by giving it a test drive with a demo trading account. You may also find it useful to set up notifications for your trading signals. There are a number of custom AO indicators that you can download from the MQL4 community, some of which come with in-built alert functionality. 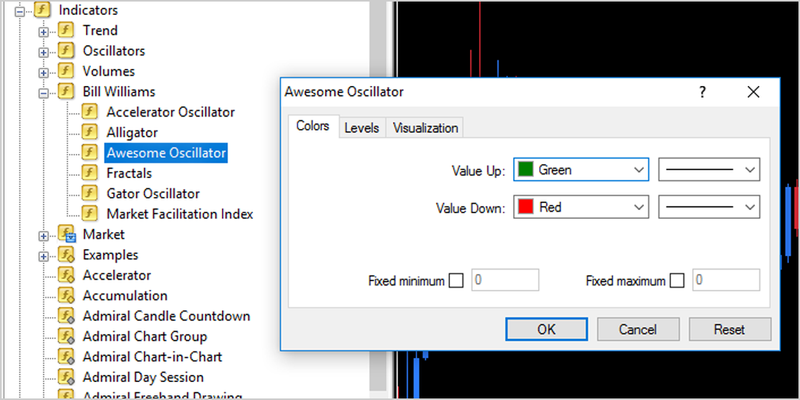 This will likely be the easiest way to create Awesome Oscillator alerts in MetaTrader 4.